Cap-Tor® Screws — Baycrest Distribution Inc.
Cap-Tor xd is the only line of deck screws on the market designed specifically for synthetic decking. Typical decking fasteners cause several defects in the surface of synthetic lumber: dimpling, white shear and curled waste. Lumber decks fastened with Cap-Tor have a clean, smooth and uniform appearance. Headcote Cap-Tor xd screws are available in Grade 305 stainless steel for excellent corrosion resistance. For locations close to or on the water, especially salt water, Grade 316 stainless steel will provide even greater corrosion resistance. 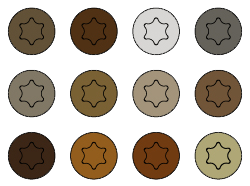 Headcote CAP-TOR xd screws available in different head colours, matching all our colour options. Cap-Tor xd screws feature a unique triangular thread design, a reverse thread section to prevent mushrooming, a type 17 tip (augur point) for speed and ease of installation, and a specially engineered head that cleanly penetrates the hard Lumberock® product. This can occur if the fastener head does not fully cut through the cap layer, resulting in a slight sloping area of decking around the fastener head. Sometimes the dimpling can stretch the cap layer to where the color is slightly deformed, resulting in a faint but noticeable lightening of the dimpled area. This can occur when the fastener head does penetrate the cap layer, but there is a ring of excess cap material that stays attached to the board, usually in one spot. Extra deep T-20 star recess to minimize the "wobble" at screw starting found in other brands. A specially engineered head that cleanly penetrates hard synthetic products. Eliminates "mushroom" effect common to decking installed using standard deck screws without pre-drilling by preventing debris from the hole from forming a mound around the screw head. Type 17 Auger tip for faster, easier entry and helps prevent splitting. For synthetic decking, Cap-Tor xd is not only the best product on the market – it is the only product on the market. 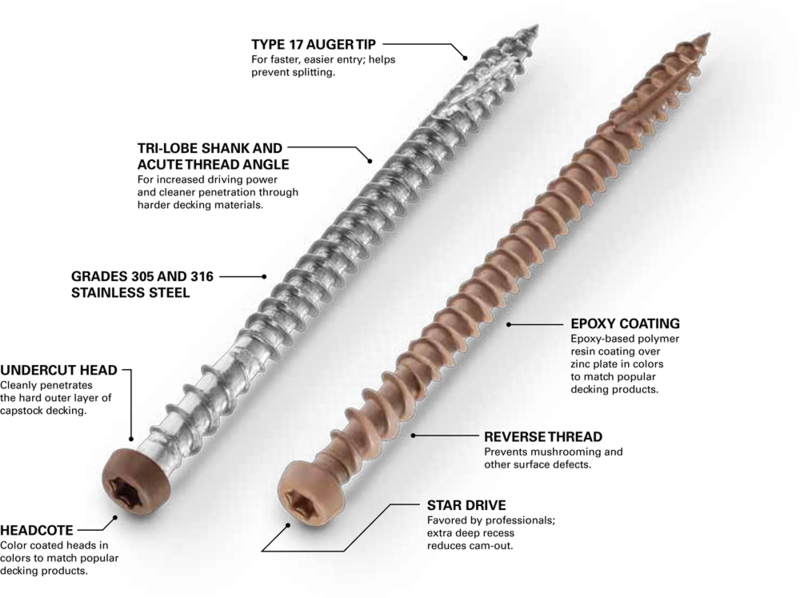 The quality and design of Cap-Tor xd screws for use in synthetic decking is also superior to other brands. Cap-Tor xd screws feature a number of unique qualities which set it apart from the competition. Headcote colours are available to blend with your new Lumberock® deckboards. Cap-Tor® xd Headcote screws are available in packs of 350, 1050, and 1750 collated for the Muro Ultra Driver. CAP-TOR® xd screws are available in multiple colours to match your lumber. For more information on fastening options please contact Jason. SMART-BIT® Deck Screw Depth Setter is designed to make fastening decks, drywall, and general screw setting easier and faster, with clean and uniform results: perfectly set screws every time. 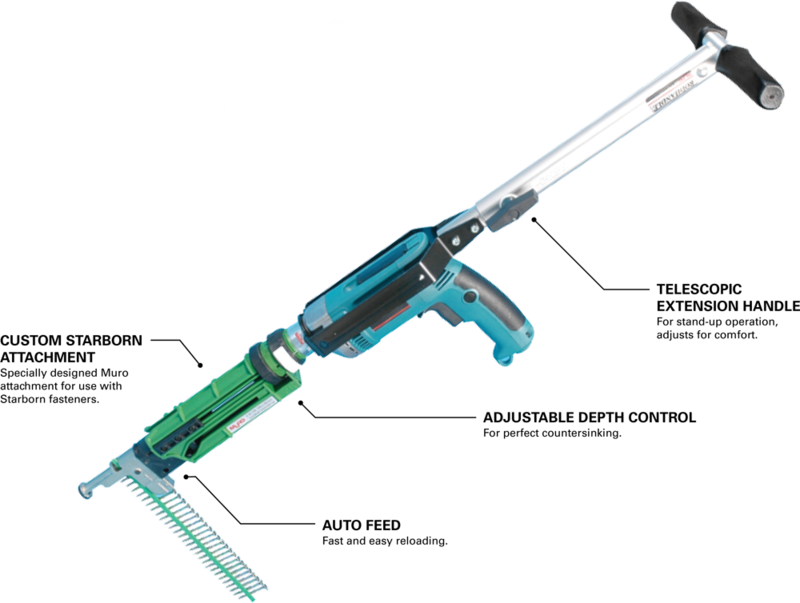 The tool is adjustable so that it can be used with many different screw types and sizes, and features an Auto-StopTM mechanism that sets the screw at the target depth without stripping the screw recess. A free spinning stop collar with rubber O-ring protects the work surface from damage or marking. 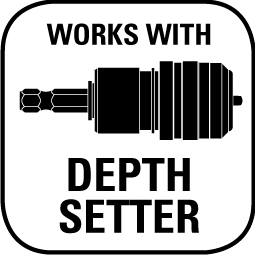 The Depth Setter works with both Phillips® and Torx® bits and is designed for use with a full range of Starborn fasteners. Muro tools are the best on the market for decking applications. They are easy to use, reliable, accurate and completely guaranteed by Muro. Starborn has recently partnered with Muro to create a specially designed attachment piece for the Muro Ultra Driver that allows Muro tools to be used with a greater range of Starborn deck fasteners. Cap-Tor® xd Headcote screws are available in packs of 1500 for use with the Muro Ultra Driver.